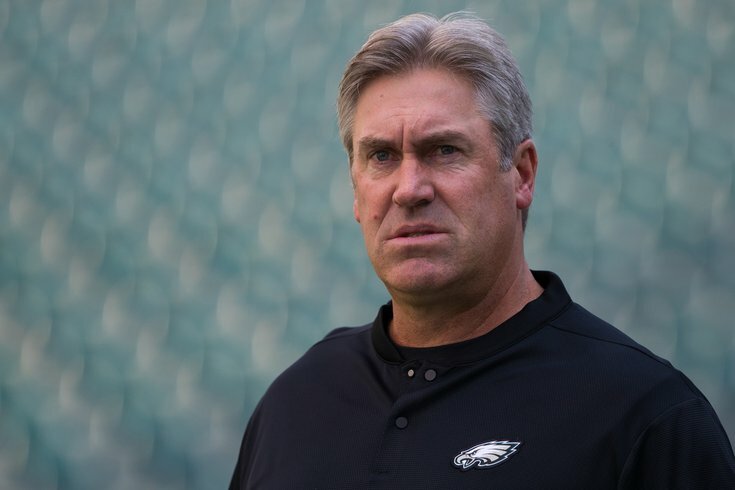 Doug Pederson tries to remember the punter's name. On the eve of the Philadelphia Eagles' second preseason game against the New England Patriots, let's go ahead an update our 53-man roster projections. I don't think Christian Hackenberg is going to make the team. Adams is getting first-team special teams reps which is a pretty good indication that he has a great chance of making the roster. He's shown more than Donnel Pumphrey, Wendell Smallwood, or Matt Jones so far, and has the most upside of the four remaining backs, in my view. I'm not a big Kamar Aiken guy, but I was told the team likes him, so ¯\_(ツ)_/¯. I considered keeping just five receivers, but with Alshon Jeffery's readiness for Week 1 in question, we'll go with six. I now believe that Rodgers is a lock. It wouldn't shock me if Josh Perkins made the final 53, but for now we'll leave him off. I think the front office will find a way to get Jordan Mailata on IR for the season and let him learn the game off to the side. The eight guys above are locks, and yes, that lock status includes Isaac Seumalo, who can't snap, but serves as the tight end in jumbo sets. Chance Warmack could certainly make the team as well on the strength of his connection with Jeff Stoutland, who clearly has clout, but I just can't put him on my 53. Last time around, I reluctantly had Elijah Qualls as my 10th lineman, but after a performance in which he had three penalties, one of which led to JuJu Smith-Schuster's long touchdown last Thursday, I can't justify his roster spot. I can, however, feel pretty good about putting Bruce Hector on there, who has flashed at times, both in practice and the first preseason game. As we noted previously, Corey Nelson hasn't done much this camp, and has been thoroughly outplayed by Gerry and Grugier-Hill. If the Eagles cut Nelson, as noted previously, Nelson would no longer count toward the compensatory pick formula, thus likely adding an extra comp pick for the Eagles in 2019. I'd rather have the extra late round pick. And of course, Nigel Bradham will return to the team after he serves his one week suspension. Wait, seven corners? Huh? Yeah, I'm just going to cut and past what I wrote last time, because my opinion hasn't changed. If a deal isn't worked out by Week 1, you can try to sneak Killings back onto the practice squad when Bradham returns from suspension. Sullivan has worked with the second team defense for the entirety of camp, so I won't knock him off the roster, but it's perhaps worth noting that Dave Fipp was talking up Stephen Roberts, even if he called him Stephen "Robertson." After some recent good short-field punting in practice (and, you know, the 81-yard bomb) I have Johnston on!